As a kid, I never thought of the impermanence of the things around me. I would gleefully run around my small world with the assurance that everything around me would still be there when I look away. But as time marched on, my world would change without my input. Some of my favorite stores would disappear when I look away and some of my novel series would end. It would always be disappointing to know that something I used to like was gone, but it never really hurt to know this. As time continued to flow and my world continued to change, my small world finally came crumbling down when one of my favorite creators, Monty Oum, passed away at the tender age of 33. I always imagined Monty would be around to create great videos and once he finally hit the main stream, he would leave an indelible mark on modern animation in the US, but this will never come to be. It makes me wonder, what would the world be like if a certain person were still alive or if a certain business were still open. What kind of things would they produce and how would the world change in response to these things? For all that I can imagine, in the end, none of it will come to pass. So with a heavy heart, I wait with teary eyes for the last game produced by the defunct Imageepoch, Stella Glow, to be released. Imageepoch was by no means the best game company out there, but what they lacked in polish, they made up in charm. Founded in 2005 by a Ryoei Mikage, Imageepoch made its mark on the game industry by releasing the first in the Luminous Arc series to a moderate financial and critical success. Spring boarding of this success, Imageepoch went onto create notable titles such as Fate/Extra, Arc Rise Fantasia, and Luminous Arc 2 (Which is my favorite game from them). Though Imageepoch had moderate success in it’s early years, this would not last. As time went on, Imageepoch would face financial trouble due to burgeoning game development costs and poor sales with games such as Time and Eternity and Criminal Girls. The writing was on the wall and it was only a matter of time Imageepoch went under, but then something strange happened. Imageepoch’s CEO, Ryoei Mikage, went missing under mysterious circumstances. I can only feel bad for those who were at Imageepoch when this all went down. Not only were they out of the job, but they also had their president’s disappearance looming over their heads… For how terribly went Imageepoch’s demise was, I’m still glad I can look back and fondly remember how much I loved their Luminous Arc Series. By no means are the Luminous Arc series games the pinnacle of their genre, but what they lacked in polish, they made up in charm. Luminous Arc 1 was at best a mediocre game that simplified nearly every aspect of the SRPG genre so that it would be more palatable to plebeians like my teenage self. What LA1 lacked in refined gameplay, it made up in excellent voice acting and charming characters. Although basically all the characters in the game were general anime archetypes, the way each character interacted with each other was so fun and engaging. LA1 got me to look at the SRPG genre by having a decent anime aesthetic and gameplay, but it wasn’t until the second entry in the series when I started to love it. Luminous Arc 2 took what was good in the first game and cranked it up to 10. The gameplay got revamped so that at once it was simpler, but more complex at the same time. Oh man, the characters were just so fun to be around. When you hear a character sarcastically say, “it’s raining girls,” in response to seeing the main heroine get launched into the main character, you know you’re in for a treat. Plus, the voice acting in this game is so good. Every line spoken gives life to each of the characters and you can just imagine what it would be like to talk with a character in real life. Luminous Arc 2 is a game near and dear to my heart and no matter how much time passes and no matter how frustrated I get with its faults, I will always desire to play a game that is similar to Luminous Arc 2. 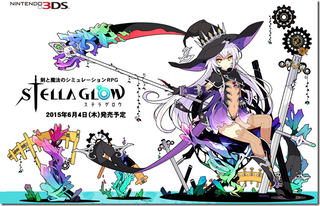 Seven long years after the last release of a Luminous Arc game released in the US, the spiritual successor to the Luminous Arc series will come the US in the form of Stella Glow. You can tell Stella Glow is a specifically a spiritual successor to LA2 because both their antagonists in both games are wearing the same hat. Joking aside, from the demo I played Stella Glow takes the core of what made Luminous Arc 2 engaging and further refines it. From what I’ve seen, the characters are excellent as ever with good voice acting and design, but what Stella Glow does better is that its main character is much more compelling. In the single chapter I played, Alto, the hero of SG, emoted as much as Roland, the hero of LA2, did throughout the entire run of LA2. Unfortunately, I wasn’t able to explore the nitty gritty of the battle system, but from the taste I got greatly impressed me. First of all, the presentation of each battle is awesome. Every single move made, excluding using an item, has a small cut scene associated with it, which is just so cool. These little cuts scenes gave me a better understanding of each character moved during battle, while also being something novel. Second, the game’s overall pace is so much faster than LA2’s because we no longer need to see every character waddle into place. Now each character kind of sprints into position, which looks silly at times, but it also keeps the game moving quickly. Stella Glow already had me sold when it was first announced, but after playing it a bit, I know it’ll be something enjoyable. It’s such a shame to know that Stella Glow is Imageepoch’s last game. Who knows what kinds of game they would produce if they were still in business. I can only dream of these possibilities, but as with all dead things, I and the rest of the Imageepoch team must move on with our lives with all the lessons that Imageepoch taught us. If you’ve ever had an interest in the strategy RPG genre or like games with an anime aesthetic, I implore you to check out Stella Glow. Who knows, you might get pulled into the genre like I did. You can find a demo of Stella Glow on the Nintendo eShop for the 3DS. Stella Glow was created by Imageepoch and published by Atlus here in the states. 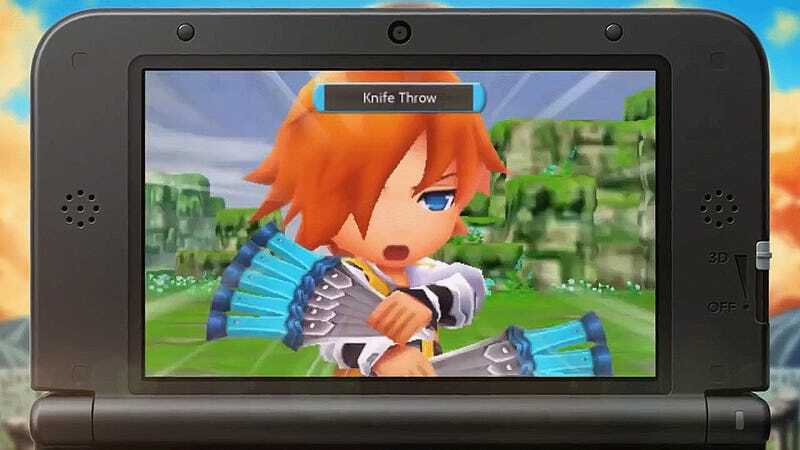 The game will be released on November 17th for the Nintendo 3DS. All first print copies come with some extra goodies like a soundtrack, a cloth poster and a charm.